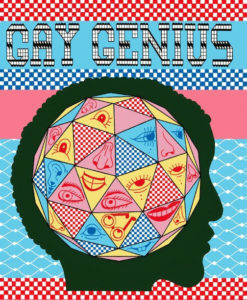 Gay Genius is a comics anthology illuminating the past, present and future of queer history makers. It is a labor of love, a celebration of possibility, an offering to the ancestors. Conceived and edited by Annie Murphy, Gay Genius is a showcase of contemporary radical queer visionaries-to-watch-out-for: Kubb E. Bear, Harmony Bianca, Sarah Sass Biscarra-Dilley, Pam Cameron-Snyder, Jackie Davis, Mat Defiler, Samantha Jane Dorsett, Edie Fake, Sailor Hollady, Elisha Lim, Annie Murphy, Leroi Newbold, Lee Relvas, Adee Roberson, Matt Runkle, Ellery Russian, Clio Reese Sady, and Silky Shoemaker. Stories range from 1 to 22 pages; subjects range from biographical to self-referential to speculative to magical and mystical.